There’s no denying how effective a CMMS can be at reducing costs and downtime for a maintenance team. According to a survey of over 500 companies using a CMMS (featured in The U.S. Department of Energy Operations and Maintenance Best Practices Guide) there was, on average, a 20.1% reduction in equipment downtime compared to when the companies weren’t using a CMMS. 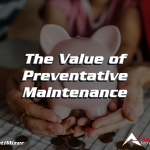 Pair that with the reported 28.3% increase in maintenance productivity and 19.4% savings in lower material costs and it’s obvious that a CMMS, given enough time, will pay for itself. In fact, according to that same survey, it took an average of only 14.5 months for a CMMS to pay back the initial investment. Imagine if all of your investments paid off that quick! You wouldn’t have that storage unit full of beanie babies anymore! So, with everything we know about how effective CMMS software can be, why is it that some CMMS implementations just don’t work? Every CMMS has its own strengths and weaknesses. It’s important to assess your maintenance team’s needs and your business needs to select the appropriate CMMS. Does your company have multiple facilities with sensitive customer data? Then an on-premise CMMS would be the right fit. It’ll help keep your data in-house and will more easily integrate with existing business software. On the other hand, if your maintenance team is small and needs basic work order software, a lightweight Software as a Service (Saas) is most likely the right choice. You can mitigate the chances of improper selection by conducting extensive research, every business has different needs and every CMMS is unique. Inadequate training of the O&M administrative staff on proper use of the CMMS. Unfortunately, some organizations like to cut corners by skirting costs they may see as superfluous, such as training. 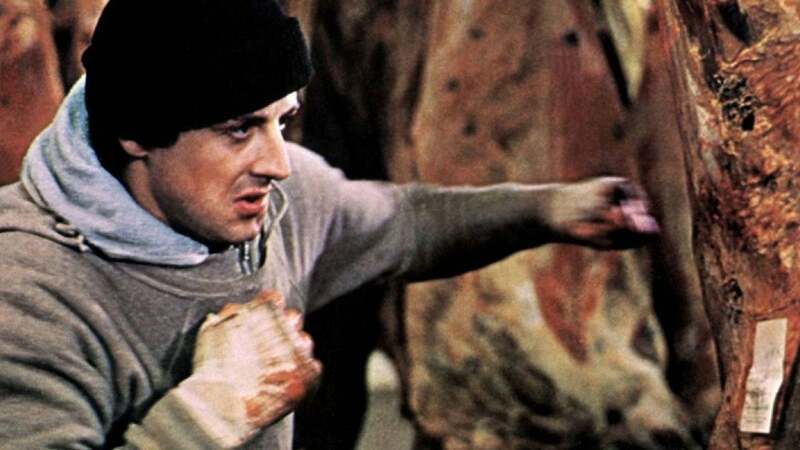 They must have never watched Rocky. 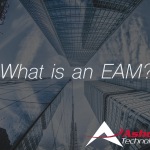 At Ashcom Technologies, we may be a little biased, but we speak from decades of experience when we say that one of the biggest indicators of whether a CMMS implementation will be successful is the number of training hours utilized. If you’re a maintenance professional then you’ve most likely taken some sort of formalized or safety training. You understand exactly how important training is when it comes to properly utilize your tools. Software is just another tool at your disposal. Unlike, say a forklift, a lack of CMMS training is unlikely to end with a hole in your warehouse wall, but it’s important nonetheless. Lack of commitment to properly implement the CMMS and lack of commitment to persist in CMMS use and integration. One of the biggest barriers to making any large-scale change in an organization is getting the staff on-board. Whether a CMMS is committed to, both in implementation and use, is largely determined by that organization’s culture. If company culture is a progressive one, where change and improvements are encouraged, then adopting a CMMS should be relatively painless. On the other hand, implementing a CMMS in a work culture with an “If it ain’t broke, don’t fix it” ideology can be a bit more of a challenge. This report does a wonderful job capturing some of the challenges we face at Ashcom when integrating CMMS software. If you want to successfully launch a CMMS and reap the long-term benefits, we find it’s helpful to remember these three basic rules: schedule the necessary training, research CMMS vendors to find the best fit, and make sure your team is ready to commit to using a CMMS in their day-to-day operations. 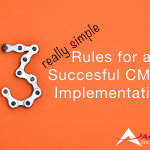 So, if we analyze these common pitfalls and flip them on their head, we can then build 3 Rules For a Successful CMMS Implementation. Rule #1: Research CMMS vendors extensively. Reading reviews and visiting company websites is a solid first step but in order to find out whether a CMMS is going to work for your specific situation, you’ll need to dig a little deeper. Get on the phone with a sales rep or CMMS engineer and explain your business problems. Then, evaluate each CMMS based on its effectiveness at solving those particular problems. Rule #2: Schedule necessary training. Once you’ve found a CMMS that aligns with your needs, you’ll need to actually use it! Most CMMS providers offer different training options. Determining the best option for your team often depends on a number of factors like travel logistics and which type of training the CMMS provider offers. If available, on-site training at your facility is usually the most effective – it offers a direct look at how the CMMS will function within your business. Other common options include in-house training, where CMMS companies host your employees at their training facilities and online training. 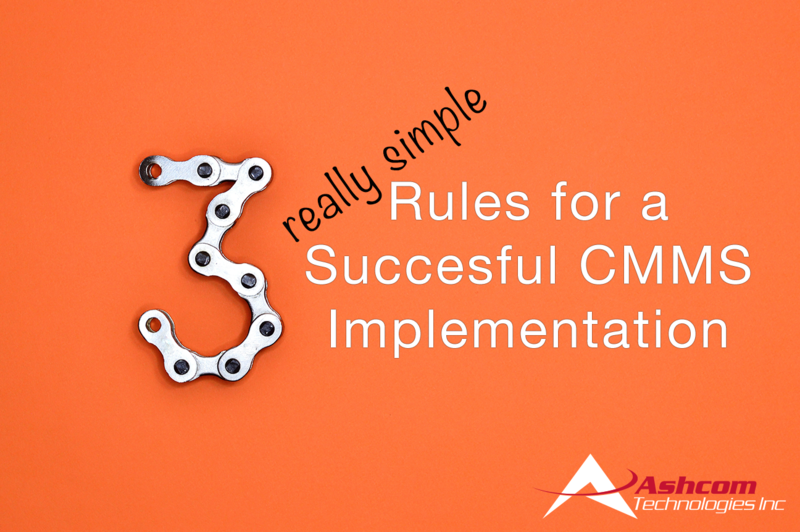 Rule #3: Ready yourself and your team to commit to using a CMMS. A CMMS can be a culture shock to an entrenched maintenance team. Adding new work processes to a busy workforce can be met with pushback and without the support of the users, a CMMS will fail. It’s incredibly important to ready your team to reassess their daily activities and determine how a CMMS can be incorporated into their responsibilities. Illustrate the increased efficiency and work processes that come with a CMMS implementation. There is an initial time investment that must be paid, but given enough time it will lighten the maintenance team’s workload. Look at that – turning lemons into lemonade! 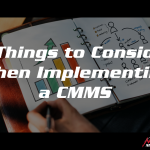 These 3 rules should help you avoid the common pitfalls, outlined above, as you navigate the CMMS shopping and implementation process.